Full Time BenefitsEqual Opportunity Employer. Cowley College practices accountability as one of its core values. Employee evaluation is central to this objective. Accordingly, Cowley College utilizes evaluation tools to evaluate: Full-time Faculty Members, Full-Time Non-Faculty Members, and the President of the College. The forms are available below. Note 1: Because all three types of College employees are hired, all evaluations are completed based on the personal observations or objective evidences rather than any political influence or undue prejudice from outside entities in order to protect the integrity of the evaluation process. Note 2: A key difference between the evaluations is the definition of the supervisor. In non-presidential evaluations, the supervisor is the immediate supervisor assigned to the employee. Regarding the presidential evaluation, the supervisor is the majority opinion of the Board of Trustees. Note 3: The primary objective of the evaluation process is to promote communication and mutual understanding between the supervisor and the employee to foster employee achievement. Note 4: Full-time Non-Faculty employees and the President are evaluated each year. Full-time Non-Faculty employees are evaluated during the spring semester. The President is evaluated on or before June 30th. Per the Master Agreement, full-time faculty shall be evaluated once each semester for the first three years of employment; once each year for the next three years; and once every three years thereafter. Evaluations are formally shared in a private setting. 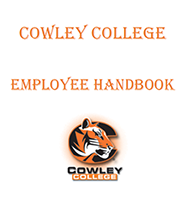 Note 5: The results of Cowley College employee evaluations are covered under privacy laws, as such are not open to public scrutiny or review.